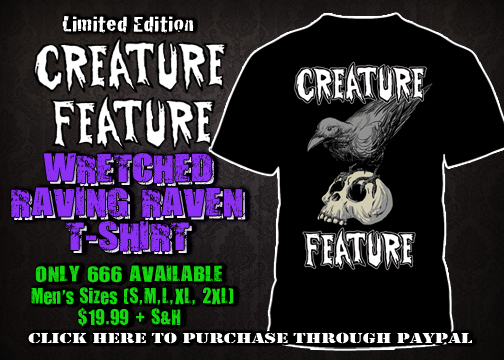 Brand New Creature Feature ‘Wretched Raving Raven’ T-Shirt! 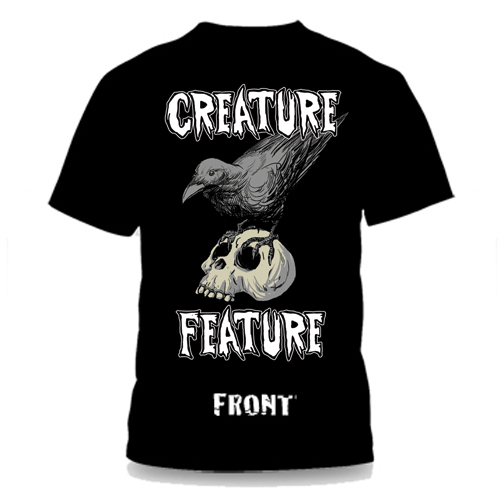 With Halloween right around the corner, Creature Feature is quickly gearing up for the spooky season again. We’re proud to announce our brand new ‘Wretched Raving Raven’ t-shirt. Poe taught us to never trust a raven, especially if it’s perched upon a skull. The shirt is single sided and limited to only 666 pieces. They are $19.99 (plus shipping & handling) and come in mens sizes: Small, Medium, Large, X-large, & 2X). Artwork by the amazing Thomas Boatwright. Please note that this is a pre-order and all shirts will be shipped on the third week of August. Click the links below to order your shirt today through Paypal or head to our official store by clicking on the “STORE” link in the navigation bar above. Halloween decorations make perfect Christmas decorations.